As one of the first football clubs in history, Sheffield Wednesday has a rich tradition. They played in the Football Alliance in the years 1889-1892 until becoming a member of the Football league in 1892. Since when, Sheffield Wednesday, have won the Division One in England four times (1903, 1904, 1929 and 1930). The club has also earned three FA Cup titles (in 1898, 1907 and 1935) and one Football League Cup title (in 1991). Sheffield Wednesday back in 1878. Sheffield Wednesday is founded in 1857 as Sheffield Club (the year of establishment is not fully agreed on, another suggestion is 1867), and is one of the oldest football clubs. The club actually existed earlier as a cricket club – The Wednesday Cricket Club was founded in 1820. The earliest documents tell that the first match between two clubs ever was played in 1857 between Sheffield and Hallam Football Club (Sheffield won with 2-0). Another early football match that is documented is Sheffield against London twice, in 1866 and in 1871. During this time the rules of the game was not set and differences occurred in the north and south. In the first meeting Londond won, but in the second meeting, which was played under Sheffield rules, Sheffield would win. In 1882, the club was parted in two different sections: cricket and football. 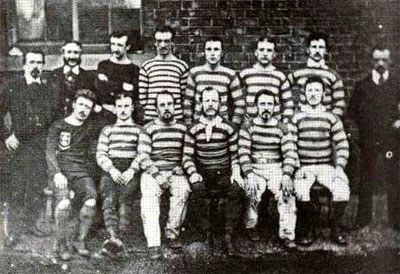 It could also be claimed that Sheffield Wednesday should be separated from Sheffield Club and in this case the establishment should be dated to the year 1867. The club established in that year were originally called The Wednesday until a change of name in 1929.